This is the loom 'waste' left over after weaving 10 towels. It is less than 2 ounces. Add the 'waste' at the beginning where I tied on, and the loom waste comes to about 2 ounces, or about $2. I don't fuss too much about the amount of 'waste' involved in weaving. As I've said before, the biggest investment in making hand woven textiles is time. 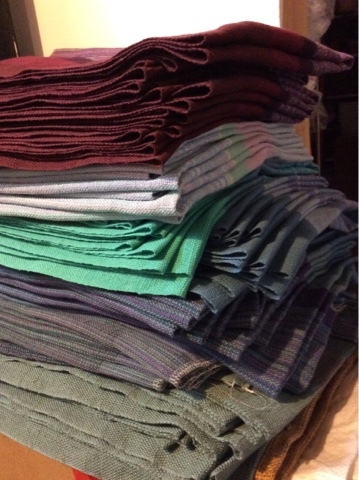 By the time I design the warp, wind it, get it into the loom, then weave it off, cut/serge the towels apart, wet finish them, hem them and give them a final press before tagging/pricing, that $2 is a drop in the bucket of what has been invested in making these towels. So I focus instead on how to work more efficiently rather than spend my time saving these thrums and then trying to make something useful out of them. 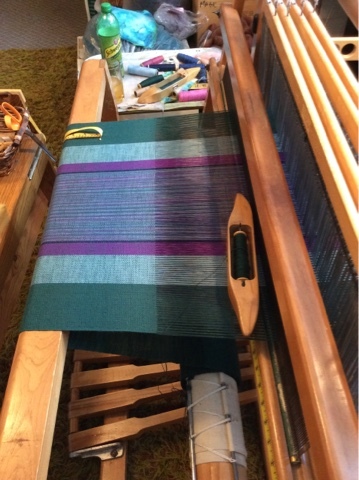 I could have woven another 3 or maybe 4 inches on this warp, but why? Instead I send the 'waste' off to be recycled, just like I do my paper, glass, cans and plastic 'waste'. We all get to decide how to invest our time. I prefer not to use it trying to save $2 worth of yarn. YMMV. There has been conversation on one of the internet groups I belong to about what it takes to be a professional in the leisure/hobby textile profession. An oxymoron, of sorts, but not really. Because there are many people who follow the profession of teaching or producing textiles to a greater or lesser extent. There are people who practice the craft, designing and making textiles for sale. There are people who research and write about the creation of textiles. There are people who teach the craft. And mostly? There are people who do all of the above. There are also people who provide the supplies for the crafts, from growing the fibre, to importing it from other countries, to dyeing unique colours, to having local yarn shops, to selling supplies on line. For me, I did all of that including weaving cloth for others. I made a great deal of my income for 9 years weaving for a fashion designer, which I discussed previously, but also for other textile artists. Sometimes it worked out, sometimes it didn't. Sometimes an international border stood in the way, like the time I wove 'samples' for a designer in New York. Getting materials across the border and back again was a pain - for both of us. Right from the beginning I taught. 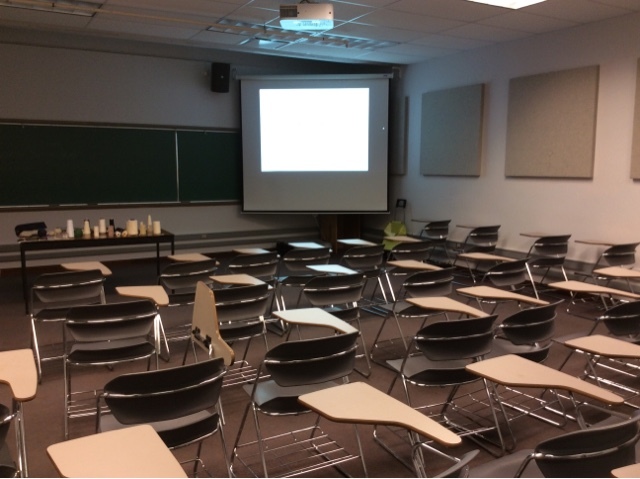 My very first workshop was a (gasp!) spinning workshop. No, I wasn't very good at it. But I was better than those people who came who knew nothing at all - and wanted to. Right from the beginning I wrote - first the local guild newsletter, then bravely sending articles off to magazines. 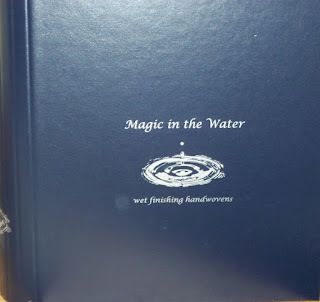 The very first one that accepted one of my articles was The Weaver's Journal. As soon as I could create enough inventory I took a booth at the local craft fair, plus I sold my textiles on consignment at a local shop. And I learned. Boy howdy, did I learn! I knew very little about retails sales, but I did know how to set up a double entry ledger and how to balance it, reconciling it to my chequebook. I knew enough that I'd rather pay an accountant than do my year end and file my taxes, so I wove enough to pay for those services. 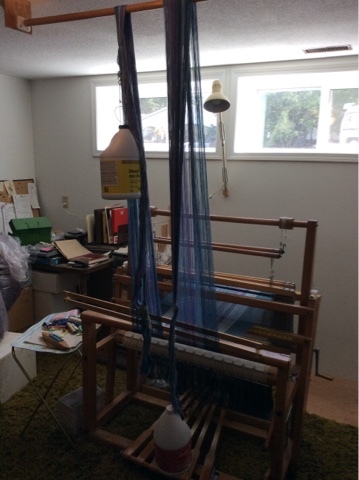 Eventually we were both working in the studio - Doug was my studio assistant, winding warps on a 'spare' beam while I wove, doing the wet finishing, hitting the road and selling what we were making. At one point I was weaving 240 yards per month - 200 for the fashion designer, 40 of my own design. We had 28 shops in western Canada buying place mats, table runners, napkins. Then everything came crashing to a halt. Instead of 28 shops, suddenly there were three. There wasn't enough work for two so Doug got a job elsewhere while I tried to figure out how to continue. I worked on the Guild of Canadian Weavers master weaver certificate, writing, teaching, scrambling to bring in enough money to keep going. And I saw the need for a book on wet finishing, so I worked on that, eventually self-publishing so I could include before and after samples. The book launched in time for Convergence in Vancouver 2002, but taking a booth to just sell a book wasn't going to pay for the booth, let alone anything else so I had started importing yarns and selling them. From there I started selling yarns at other fibre events, but most of the vendors were all pretty much selling the same things so I started importing yarns from China and dyeing them so sell. And in between, I wrote and taught, and wove. I gave up weaving for the fashion designer when I spent more time away teaching one year than I was home. But that sort of teaching schedule wasn't sustainable, especially when I started having health issues. Something had to give and I pared back on the teaching. And then the dyeing. Because dyeing is actually harder physically than weaving (for me). And of course I never seemed to have the 'right' colour in the right yarn in the right quantity. Eventually I just wove up whatever yarn was left over from those days. I've been in this business for 40+ years now. I have pretty much tried everything. I have pretty much enjoyed a lot of it - some of it not so much. Bottom line? If you want to be a professional in this line of work? It's hard. You have to show up. Every day. You have to be self-motivated. You have to either do it yourself, or make enough money to hire someone else to do it. But most of all? You have to just do it. Nike got that part right. I forget how many towels are in this stack - 70? 80? Doug went pressing yesterday so there are 20 more waiting for me to hem while these wait for Doug to have time to go pressing again. Plus all the ones that are in the later stages of production - some already tagged, some just needing tagging. Let's just say I have more than enough of this style of tea towels*, probably for several years to come. But they were just the balm for my soul that I needed for the past few months. I have two more warps of this design in the pipeline and then it will be (past) time to deal with the rest of the warp on the AVL - 40 yards of fabric for the conference here in '19. Some of that cloth will be used to decorate the hall(s) for the conference, some will be used in other ways and, once the conference is over, they can be turned into souvenir tea towels. But first they have to get woven. In other aspects of my life, things are also slowly progressing. I have a workshop to teach in October so that needs to be dealt with. This class has way more 8 shaft looms than usual and most of them floor looms, so that means an extreme 'tweaking' is needed for the drafts. I have been reluctant to do such a deep editing of the workshop because it will be the last time I teach this topic and the time it takes will be significant. On the other hand, why not go out in a blaze of 'glory'? I have managed to clear some things off my desk - the oral history mom did back in oh, 2005? - was kindly transcribed for me by a friend and I added some stories mom had typed out - single spaced, no paragraph breaks, ALL CAPS! I really had to force myself to transcribe those, but I'm glad I did because I 'heard' some stories I'd forgotten, or never really knew. I will likely print out the edited transcript because I prefer reading from a paper copy, not digital. I am nearly 'done' with my obligations for Olds College for this year - just one more student who is scrambling to complete her last sample. I really want to finish this so I can clear my head space of thinking about Olds for a while. I'm waiting for an important delivery today, so instead of being at the loom where I might not hear the doorbell, I've been sitting plying the next yarn. And thinking. Lots of time to think when plying. I started thinking about how we 'invest' in our lives. So many ways to invest our time, our energy, our talents. For me the investment for the past 40+ years has been primarily in weaving. To that end I have invested some time in learning more about spinning. But I'm not 'invested' in spinning the way I am in weaving. Learning more about spinning, how yarns are created, is more about learning how to become a better weaver, understanding my materials at a deeper level. I'm not invested in actually becoming an expert spinner, all I'm doing is playing, really. My understanding of spinning is much more on an intellectual level, not a practical or skilled level. And my play time feeds into my hobby of knitting. 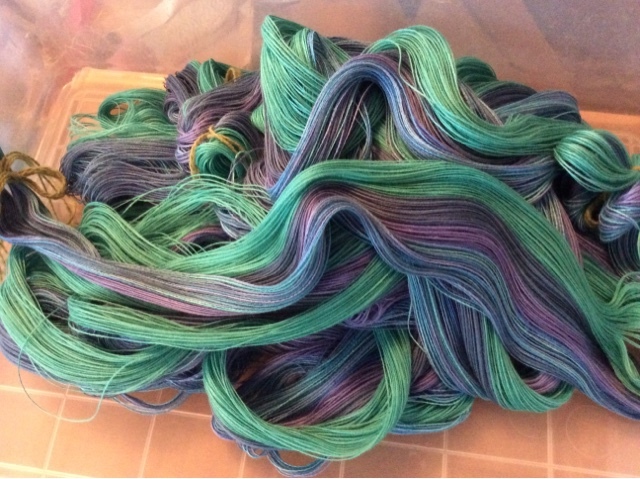 Creating unique blends/yarns is a colour study in and of itself, watching how those blends spin up and then knitting with them is all grist for the creative mill. Yesterday I was talking to a (much) younger friend and I commented that I had no clue when I chose weaving the experiences I would have, the people I would meet. With all the challenges of being a self-employed artisan, trying to design, make and sell my textiles, this career has brought enrichment I never dreamed of. Or only dreamed of. In my secret thoughts I wanted to write. Weaving has allowed me to do that. In my secret thoughts I wanted respect. I think I have earned that. I certainly have an amazing circle of friends who support and encourage me when I falter, paralyzed by...fear. As a teacher I am not so much interested in making mini-me's who will do exactly as I do but urge students to think for themselves. "Become your own expert" I tell them. And I mean it. So when I mark the Olds homework, I am not looking for people to do the exercises by rote. I am looking to see what lessons they have learned, what challenges they may have overcome. I am looking to see if they are exhibiting critical thinking skills, increasing their physical skills (as shown in their samples), understand for themselves where they are weakest and need to invest their time. The past while has been challenging for me on a personal level. Trying to also write a book is proving to be one challenge too many right at the minute. And so I am going to take a little more time before diving back into it, explore some options (I hear you when you say you want a 'real' - as in paper - book), think about the content I have generated so far and what I need to add. I have not given up on it entirely. I just want to stop and check I am on the right path before I invest more of my (and my friends) time in it. 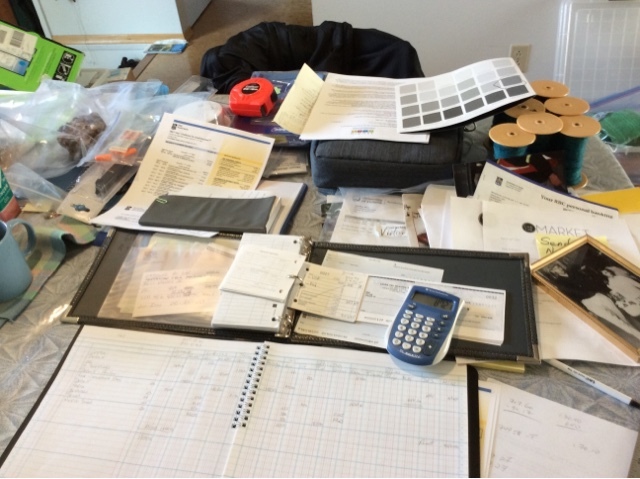 I am trying to cross some long delayed chores off my task list, the primary one being getting my ledger entries done, balanced, reconciled to my cheque book and file my GST (sales tax) for the second quarter of the year. I've got until the end of the month, but I'm due a refund and I really need the money. My 'dining' room table has become my de facto office. It is also the hold all for all manner of things. Doug's tools because he's been getting to a pile of 'odd' jobs that have needed done for a long time, some just since the outside got renovated. The renovation domino effect has meant that things that we were content to live with have now been affected, or in some cases, new stuff that needs doing. Like the tile surround in the kitchen that had to be removed to fit the new, larger windows. Some, like the garage door, needs to be painted, so there is a colour/chip card with our choice of new paint colour. I've had little income this year and the usual - indeed, extra - expenses so to add to everything else I'm having to 'finance' the business for the next few months. All part of being a self-employed weaver - the mad scramble to make things, paying for materials up front but the income from their potential sales months down the road. Having to pay for travel to events ahead of time, sometimes months before, but not getting paid until well after the event. With cyclical income streams - in other words, out for months, in for about six weeks in the fall, with a dribble of income from teaching during the rest of the year. The past year has had 'extra' stress due to the renovations to the house, disrupting my studio with having to make room for the trades to work, plus the noise, dust and general kerfuffle. Plus mom dying. I'm also older and not so resilient. So I have finally embraced the concept of 'semi-retirement'. But not quite yet. Because now we start gearing up for the 2019 ANWG conference. To that end I have been in touch with instructors. I have almost filled all the spots, just two more disciplines to find people for - quilting and knitting. I have some leads, just need to find contact info. Then, once I have everyone's topics, we will go through them and begin to design an event that will hopefully provide a quality experience, not just for the registrants, but for the instructors, vendors, etc. I bang on about the Master Weaving program at Olds College, but I also want to tell people about the Master Spinning program. I came to weaving via the orifice of a spinning wheel. 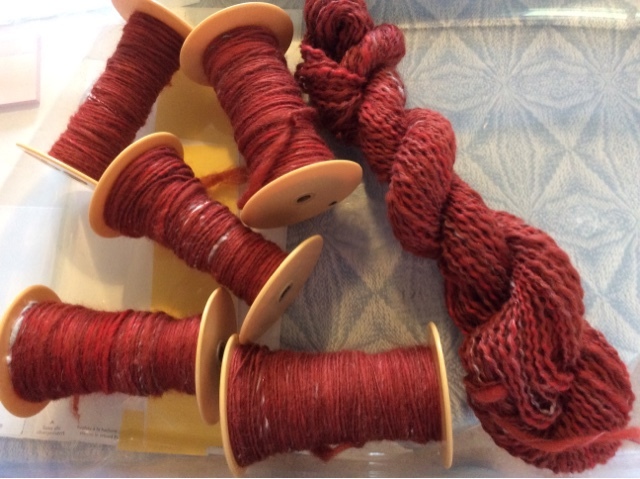 Once I discovered weaving, spinning got set aside because I simply had no time to do it. Eventually I sold my spinning wheels and moved on. But about 12 or so years ago, the universe began 'gifting' me with spinning wheels. A phone call asking if I could come pick up a loom for free, which turned out to be a spinning wheel. Another phone call asking if I could take a wheel. And so on. None of these 'gifts' was quite 'right' for me and eventually I wound up buying a Canadian Production Wheel. I prefer to spin woollen (supported long draw) from rolags and I really needed a wheel with a higher ratio than most wheels on the market. I have been happily spinning on 'Larry' for a few years now. 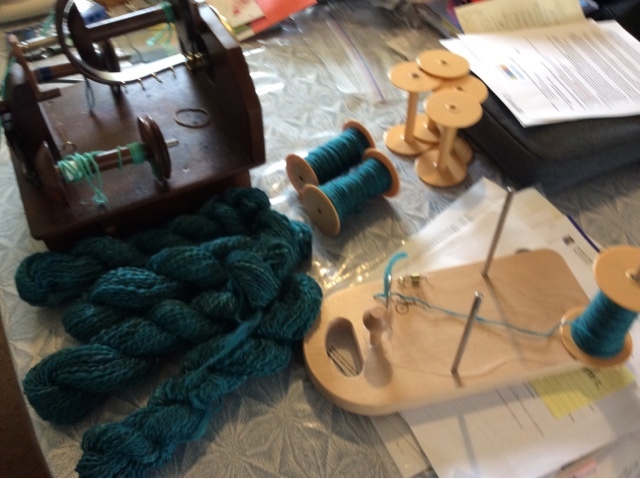 As the 'free' wheels began showing up in my life, I started taking workshops from spinning teachers, not because I particularly wanted to become a better spinner, but because I wanted to be a better weaver. Having arrived at weaving with a basic level of understanding how yarn was made, and having investigated yarn and fibre properties on my own, I found myself wanting to know more, know my materials better. I knew that the way to do that was to take spinning classes. And so over the past few years I've taken classes with Judith MacKenzie, Kim McKenna, and several from Mary Lessman. Mary is a graduate of the Olds College Master Spinner program and has now begun teaching classes for that program. If you are ever in a position to take a workshop from her, I highly recommend taking it. 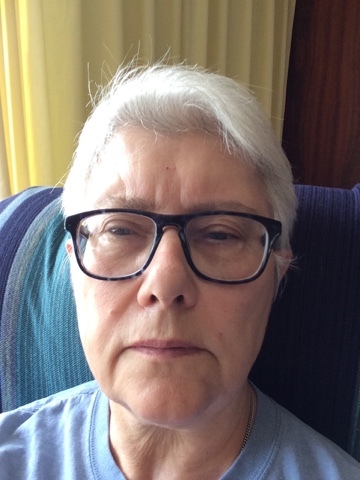 She is teaching at several venues in the US (check out the off campus link on the college website above) plus she has agreed to be one of the instructors for the ANWG conference here in 2019. I have lined up most of the instructors for our conference and the conference website should be up by the end of summer. Stay tuned! Over the years I have trained my eye to see inconsistencies. Imperfections. And then fix them. As I worked with finer and finer yarns, those little inconsistencies became harder and harder to see. Sometimes I don't catch them until I've woven a couple more picks. Once the float is 'framed' by more correct picks, it shows up better. But as quickly as I weave and using finer threads, sometimes I have to rely on other sensory input to realize something has gone wrong. In addition to seeing the actual problem, I pay attention to other indicators. I watch the top of the shed. If it doesn't open consistently I look closely at that area. Sometimes the shuttle will hit an end if the shed doesn't open cleanly, pulling more slack on that thread. Then it is looser than the ends on either side and may not open all the way so that the next time the shuttle will go over instead of under it. Which is what happened in the above example. I pay attention to the working of the loom and shuttle. If something feels different than the time(s) before, I look more closely. I pay attention to how the loom and shuttle sound. Staying in focus, paying attention to what I am doing, not thinking about other things - weaving becomes a working meditation. Staying in the now, setting aside the tensions, the stresses of life, help to relieve the stress. Putting those stresses firmly outside the studio allows me to have relief from them. I get aerobic exercise, produce endorphins, plus at the end of a weaving session I have produced cloth. 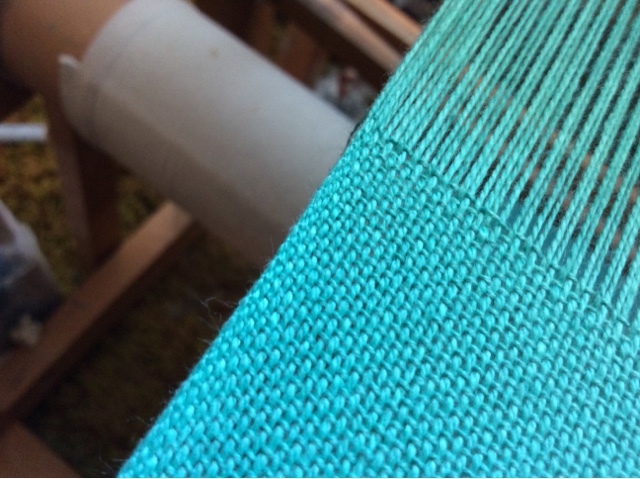 Mindful weaving - it's helpful, healthful - and brings me closer to 'perfection' than not being present in the moment. I very quickly learned about tying knots and bows. Knots are good. Knots are secure. Knots can be damned hard to un-do. So I learned to not tie a knot unless I really needed to secure something for the duration of whatever it was I was doing. That meant learning when something had to be temporarily secure, and when it needed to be secure, period. It meant I had to think through the process and analyse it to decide which was most appropriate - a knot? or a bow? The process of analyzing the the steps involved in weaving also taught me how much security I really needed to do the job. Like most new weavers I tended to go for lots and lots of 'security'. I would carefully tie off the four 'arms' of the cross plus the waist, then in addition to the choke tie near the cross and the counting tie at the other end, I would tie off the warp every yard along the length. But tying all those ties? Takes time. Un-tying all those ties? Takes time. It gradually dawned on me that tying the waist of the cross meant I was compressing the yarns making it more difficult to sort out the ends to do the next step, plus tying every yard along the length was just adding more labour to what is already a labour intensive process. Eventually I learned what worked best in terms of how many ends/inches of warp to wind on my warping mill and/or board. Multiple tiny warp chains just mean more ties to tie. More than 15" worth of warp in a chain becomes cumbersome. What a weaver actually does will depend on so many things - the yarns they are using, the equipment they have at their disposal, and so on. Ultimately everyone has to figure out what works 'best' for them. Remembering a few key principles will help guide the weaver in choosing what works best. Knowing several different ways of achieving the same thing - a warp wound and beamed under sufficient consistent tension - means choosing the correct tool/process for the job. Bottom line? If you are happy with your results, you don't need to change a thing. If you aren't happy, then you might like to try something else. Latest tea towel warp. I should be weaving the ones already wound, but I couldn't resist this combination. The other day I was describing myself to someone who knows me but not very well. I said that I was analytical and a planner, both good traits for a weaver. Anyone who wants to learn how to weave can do so, some with more ease than others. It all depends on what one wants to accomplish, why one wants to do it, how much manual dexterity and mechanical aptitude one has. Human beings have been playing with string for a very long time. If it was impossible to learn, weaving (and spinning and felting and all the other myriad textile crafts) would not have grown up around the world, in almost every culture. But there are levels of understanding. If a person is only interested in making 'perfect' textiles without digging into the principles of the craft there are numerous books and websites that give directions, right down to including the colours to use. Shops will even make up kits with the yarn already included - all the weaver has to do is wind the warp according to the directions, dress the loom and weave, again according to directions. There is absolutely nothing wrong with this. We live in a high stress society and sometimes it is rather lovely to just follow directions and wind up with something attractive. Stress relief may mean shutting the brain off for a while, not taxing it with more questions, more decisions. Other people find that very process challenging in a good way. They set aside their stress by focusing on something completely different. They like to delve into what makes a textile pleasing to them. They like the 'what if' questions - what if I do this instead? what if I try that? what happens if I change...? Being analytical, those are the questions that excite me. All those variations. All those options. All the different combinations to try. I am also a planner, so plotting the process from start to end is also something that excites me. Starting from the colour cards of yarn, figuring out density, weave structure, design - all of that engages me creatively and intellectually. Having an overview of my year - teaching dates, show dates - planning how to fit production, class prep, marking, travel, into my schedule can be taxing but also exciting. And I like to challenge myself. As I mentioned previously, I think, this series of towels has proven to be a real learning exercise. I'm not an intuitive colourist, I had to work hard to find out what worked - and what didn't. I still miss the mark occasionally, but less frequently, and not so widely. I had gotten fairly comfortable working with three colours, then four, but this series has five different colours - four solids and one variegated. Sometimes that fourth solid is really hard to choose. I have just committed to continuing to teach the Olds program - if they want me. It may not be perfect but they are working on it. And it is geared towards learning the why of weaving, not just the how. It challenges the students to consider the what ifs, the what happens when. Not everyone is comfortable with this approach, but even if the students learn better ergonomics, better techniques, better options - then I feel I have succeeded as a teacher. Feeling a wee bit punky today after dental surgery this morning. I have a phobia about such things due to an unfortunate encounter with a dentist when I was 5 or so. Standard dental care, no problem, but otherwise? Nervous! So last night I didn't sleep well in anticipation of the 9 am appointment. However, I would really like to get my mouth fixed, so I showed up on time and with as good an attitude as I could manage given my history. The orthodontist was very kind and reports from friends who had seen him were all highly positive. So I got into the 'zone' and let him do what was necessary. I'm supposed to ice for 10 minutes on, 10 minutes off, which doesn't leave a lot of time for doing any handwork. So I've been vegging on the ipad, cycling through Facebook, Ravelry, my emails and round and round and round I go. After eating a big bowl of rice pudding I made when I got home this morning, however, I'm feeling a little more perky. That, plus the hour long nap, I suppose! Anyway, so far so good with pain management and the swelling doesn't seem to be terrible, so hopefully I can do 'light' duties tomorrow. Yesterday I pulled colours for yet another tea towel warp, the loom is currently empty, so that needs to be dealt with, plus there is homework to mark, book to be read, puzzles to make, knitting and plying to be done. If I don't get anything accomplished tomorrow, it won't be from lack of options! One of the issues that new weavers have is how to hold and throw their shuttle. During my travels in June I talked to several people who said this was a problem for them. First of all, I am interested to know how they are actually holding their shuttles. If it is overhand, I recommend that they try holding it this way - cradled in their fingers is the best way I can explain it. The above photo shows 'catching' - the point of the shuttle goes between my index and middle finger which allows my thumb to control the let off of the yarn from the bobbin. The shuttle should be 'thrown' (actually propelled by the index finger) as close to the reed as possible as that is where the shed is the tallest. My preference is for Leclerc brand wooden shuttles, but people with small hands find them too long. In that case I recommend finding something that is shorter - Bluster Bay and Harrisville Designs both make shuttles with a snub nose. 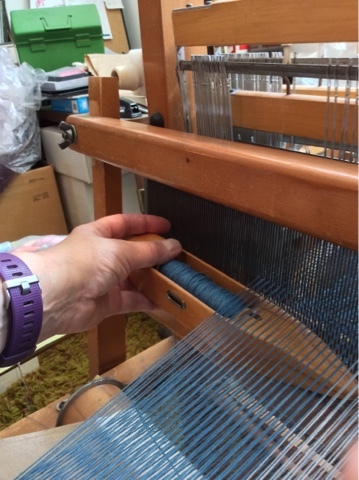 Once the weft has been set, my thumb moves to the top of the shuttle, then my index finger moves to the point of the shuttle so it can be 'thrown' back for the next pick. To beat the pick to the fell, I lift my hand holding the shuttle just enough for the beater to move below. I weave fast. All the motions of weaving roll one into the other. My weaving rhythm depends on what I am weaving, how tightly I want the cloth to be. An open cloth must be woven more slowly as each pick needs to be carefully set into the web. A 'standard' cloth can be woven more quickly. A dense cloth can be woven even more quickly as the force required to beat the pick in means the beater bounces back from the fell more quickly. The point is not how quickly a weaver weaves, but that they wind up with the quality of cloth they desire. But learning more efficient processes means that cloth comes off the loom more quickly. If that's not important, then each person needs to do what is appropriate for them. I got home late afternoon on Tuesday (leaving Richmond at 5 am). Yesterday was filled with appointments - including a change in the date of my dental surgery. It will take place on Monday, not a week from now. 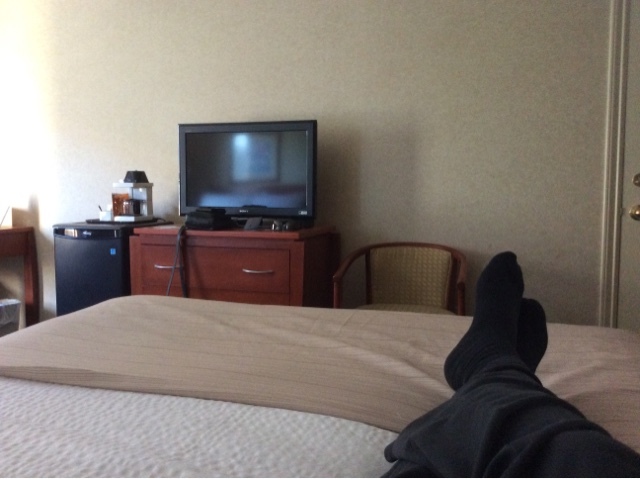 So things have to be changed around in order to leave me some time for recovery. To that end I decided I needed to at least dress the small loom. Of the two looms, this one is a little more 'gentle' on my body and the one that I will likely feel like weaving on soonest. Having four warps already wound, waiting in the wings, so to speak, I simply chose the one on the top of the heap and started beaming it this morning. The next two days are similarly filled with appointments so working on it will be catch as catch can. 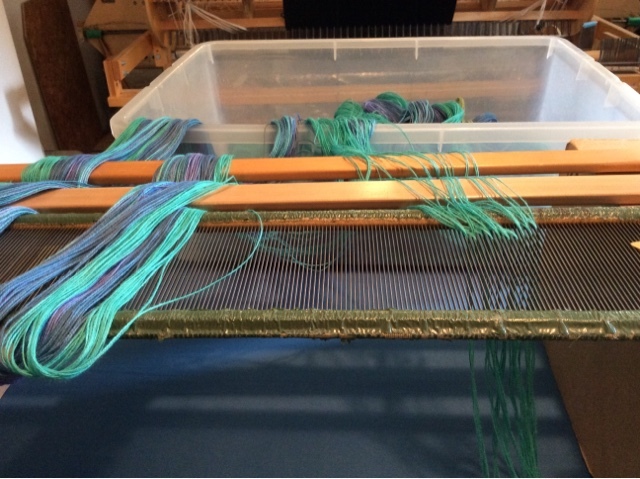 I rarely put less than 11 meters of warp onto this loom, although I will if I'm sampling. 11 meters of warp yields 10 towels. Usually. Dressing the loom is the biggest investment in time so I want to make as many items as I can on a warp. Unless, as mentioned, I'm sampling. Yes, after 40+ years of weaving I do still sample. I have not worked with every single yarn, so when I get one that is new-to-me, I need to find out the hidden potential locked in the yarn. Does it have sufficient twist to hold together as warp? If not, do I want to go to the work of sizing it? What sort of epi/ppi do I want to use with it? What happens when the density changes? The weave structure? 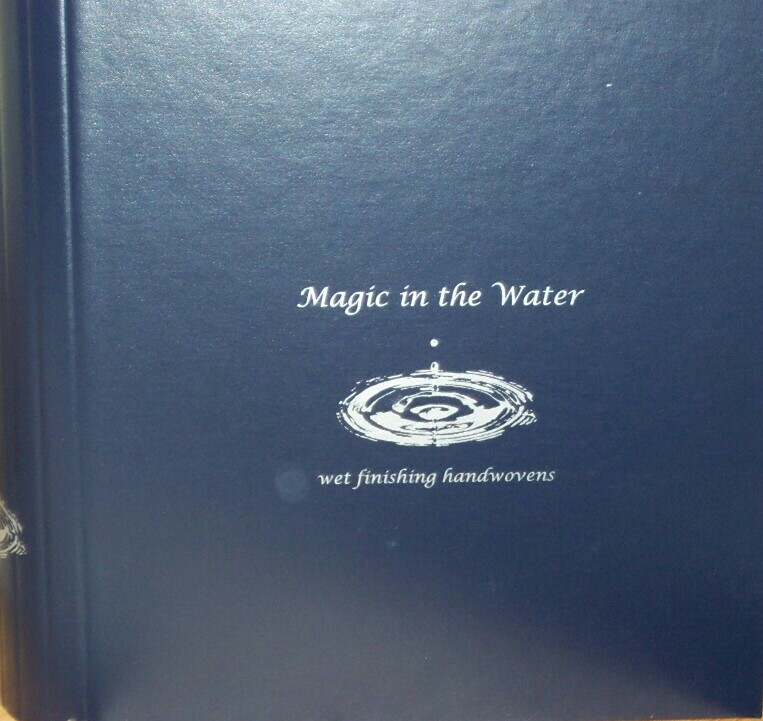 Most of all, what happens during wet finishing? Because it isn't finished until it's wet finished. I have some 'test' scarves I wove from hand spun singles that need to be wet finished. I had hoped to do that while Mary was here, but somehow we ran out of time. Mary is a master spinner (Olds College master spinner program graduate) and we have been working on this research project for nearly two years. 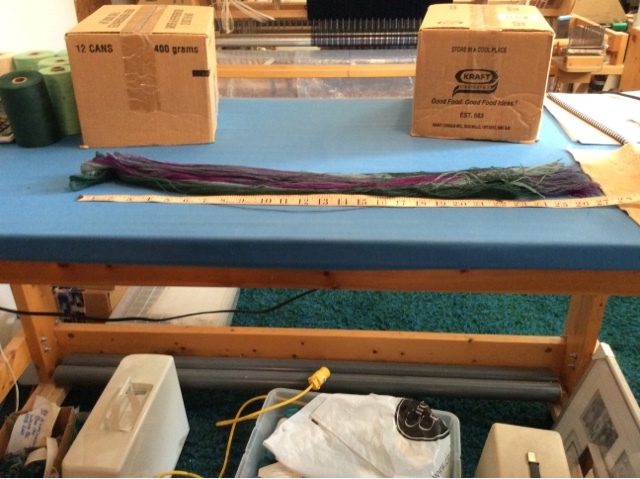 It has been a learning curve for both of us as we explored the effects of twists per inch on the singles, the twist direction, how the yarn behaved in the loom and during wet finishing. The three scarves continue the exploration but until they are wet finished....well that is the last step and I'm hoping to do that today or tomorrow in between appointments. 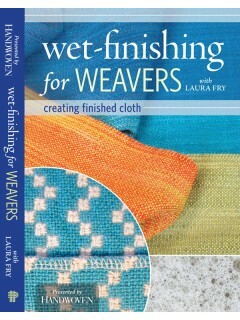 I now have in my hands (so to speak) the latest edits for The Intentional Weaver. Over the past month I have had a lot of time to think about this whole flawed business of creating content for others to buy. I have been writing about weaving almost since I started weaving and every single time I go through the same angst: will it be good enough? Will *I* be good enough? At some point in time an author just has to stop. Stop polishing. Stop tweaking. Stop agonizing. Just say "it's the best I can do" and let it go out into the world to make its way, sink or swim. I am well aware that some people will be disappointed. Some will find what I have done sadly lacking. Some will share their opinion of my failure. Others will find value. Others will be helped. Others will discover things they never thought about before. Others will be able to tweak their own processes and make progress. 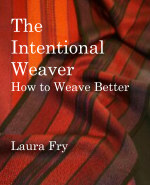 It is those 'others' that The Intentional Weaver is for. I am not trying to write the 'compleat' book of weaving. I am not trying to write the 'only book you'll ever need'. I am not actually trying to write a 'how to learn how to weave' book. My approach is instead to write a book that will explain more of the why of the craft, not just the how (although there will be some of that to illustrate the how in relationship to the why). And so I have come to the point in my life where, once I have read through the edits by my beta reader and made what 'corrections' are necessary I will set aside this first part as being pretty much 'finished' (as much as any writing is ever 'finished') and concentrate on the projects I want to include. The projects are intended as a way to illustrate some of the points in the main body of the text. Hints and tips specific to those projects will be included where appropriate. The photographs and whatever diagrams I deem necessary still need to be dealt with but over the past month I have come to the conclusion that I have said pretty much what I wanted to say and it is time to move toward the conclusion of this project.